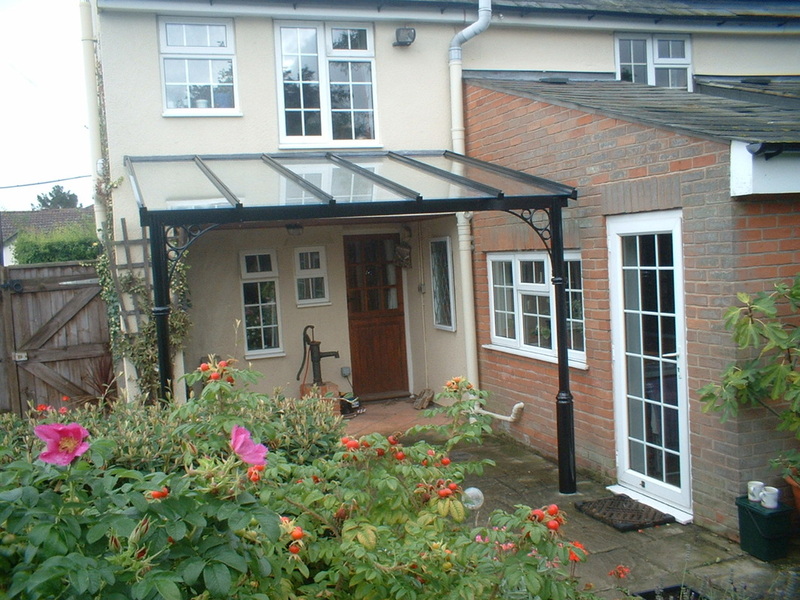 This installation shows what a transformation the installation of a glass awning can make to a home. 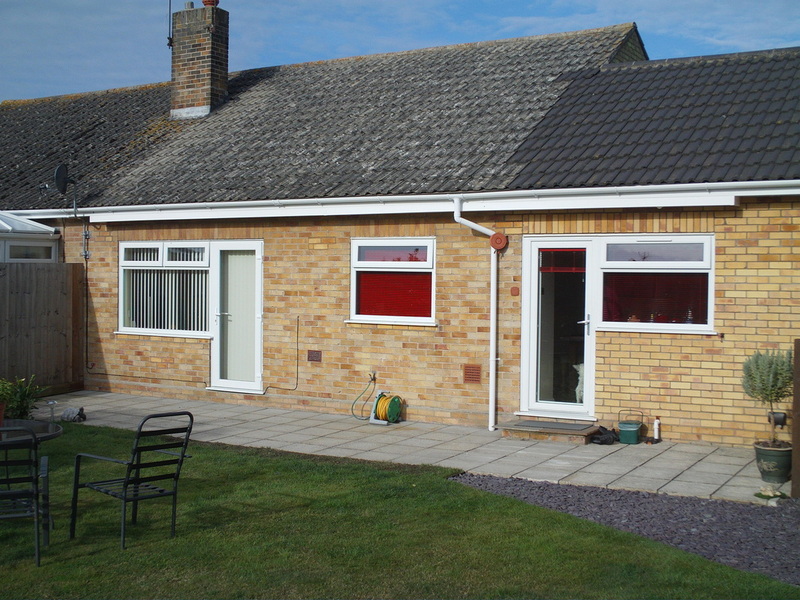 This customer was so pleased with the colour that she had the kitchen units painted to match linking the garden back into the house. 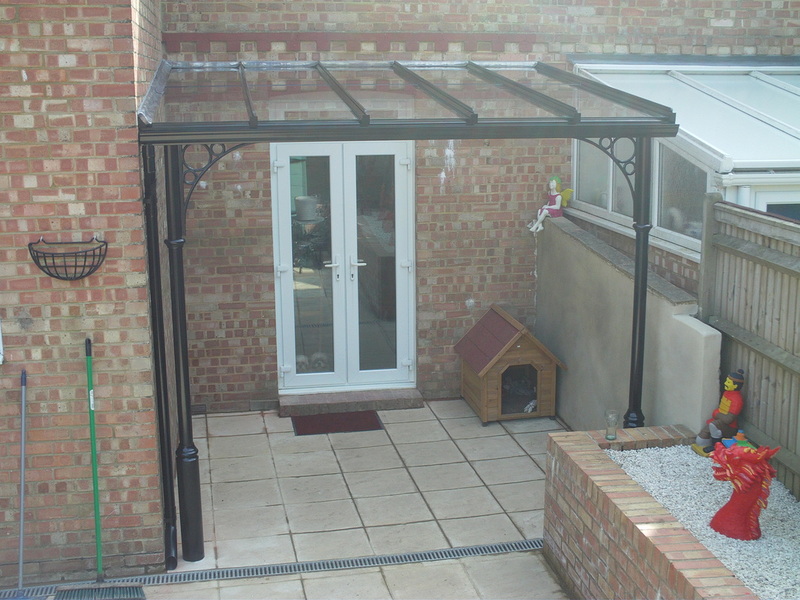 This installation shows the merits of a glass veranda. It provides a beautiful intimate space at the back of a home providing cover over an interesting patio area. The clematis has been trailed over the fence at the installation stage and the owner is planning to pin it back to the wall just under the veranda roof. 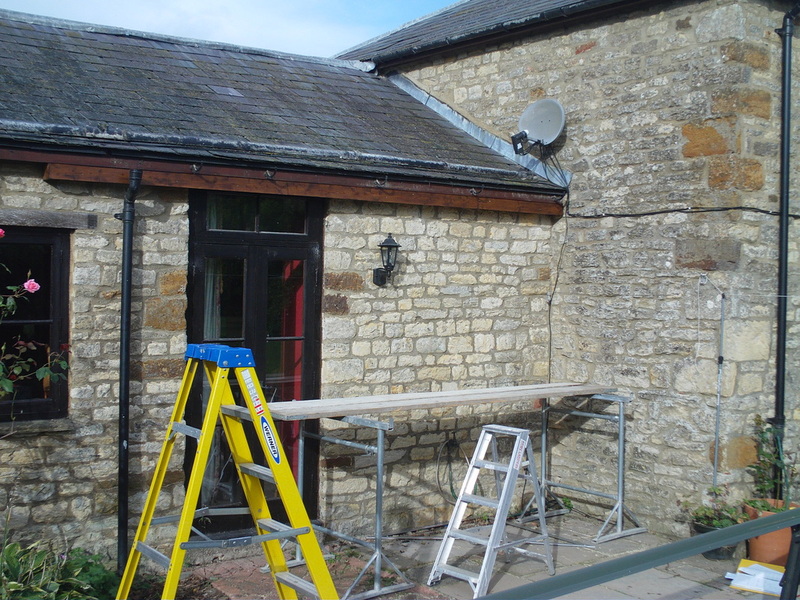 These photos show a veranda installed on the fascia of a single story extension. The veranda fits neatly under the guttering which takes the rain water from the roof above and prevents dirt from falling onto the glass veranda. 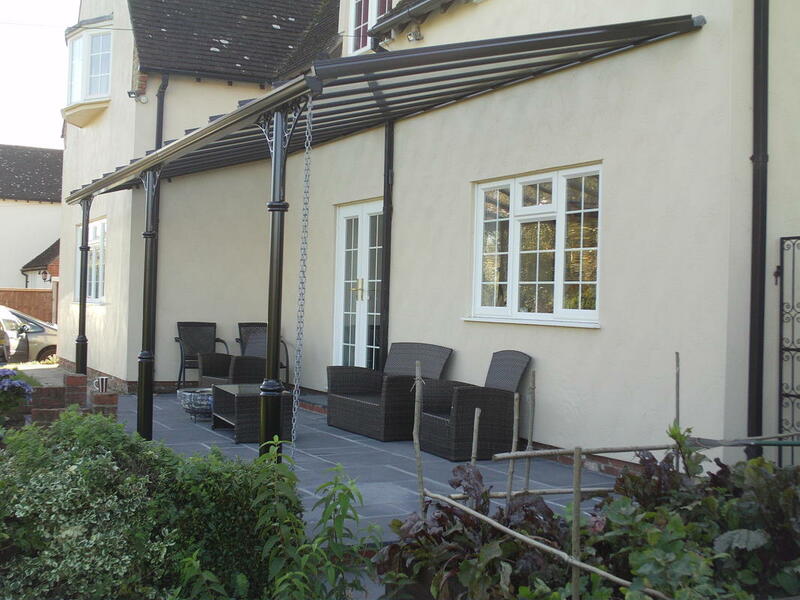 This veranda made a dry area in front of alcove creating a really useful space for the homeowner. Outdoor dining and relaxation is no longer hostage to the weather. A wonderful new area is being created in a garden in Denham, west of London to catch the sunshine throughout the day. This space has been covered by a three legged Victoria glass veranda and will soon benefit from decking to unify the area completely. It turns what was an old car parking space to the rear the garage into a delicious recreation area. We recently completed our largest ever glass veranda. 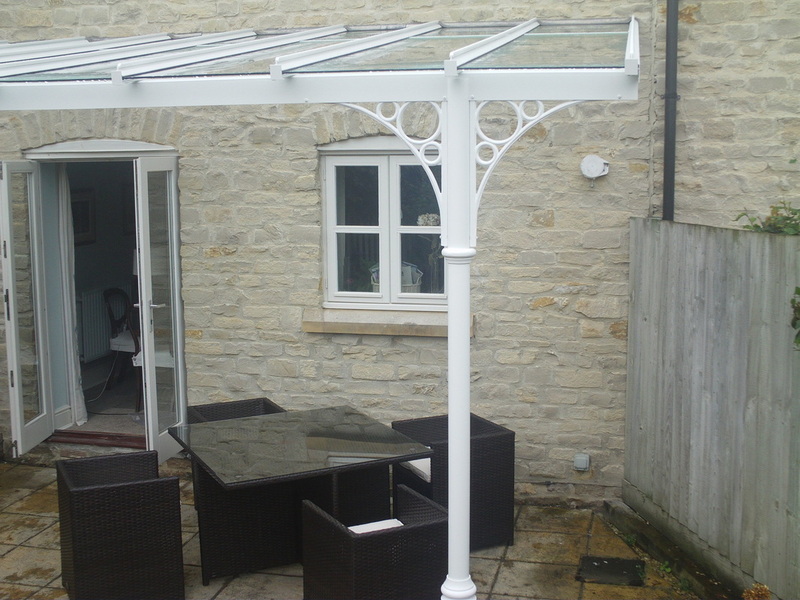 This is a 7.2m x 4.0m veranda covering a south facing patio area. The customer cut down some trees in his garden and discovered that the patio area was a real suntrap. To take advantage of the new found warmth he ordered a just-verandas glass veranda and is thrilled with the results. 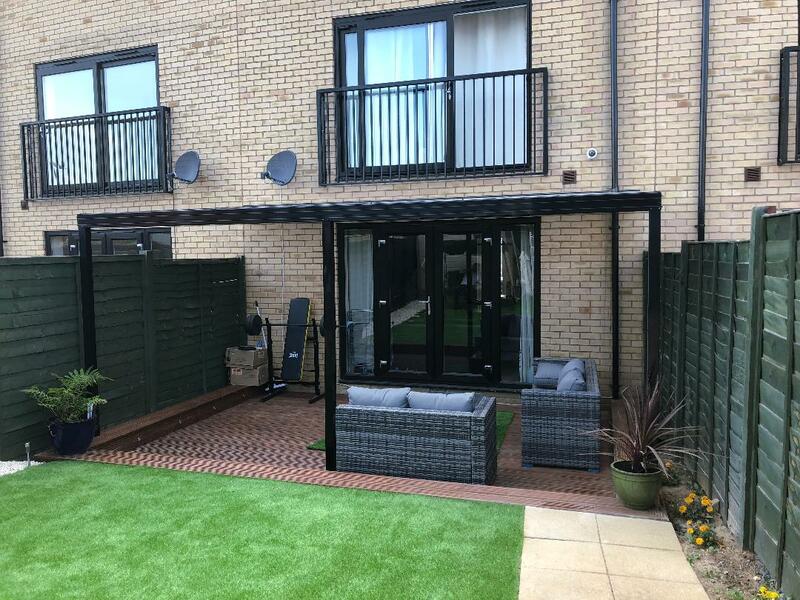 A graphite black satin glass veranda was installed in Putney SW15 over a slate patio with spectacular results. It complimented the victorian town house with its modern ground floor extension making for a wonderful dry area linking the kitchen and the ground floor music room to the garden. A great decision by one of our discerning customers. A delightful brand new home from Crest Nicholson builders has been enhanced with the addition of a Just Verandas three post veranda. It compliments the newly laid patio and fits neatly against the house making a real feature and allowing all the windows and doors to open fully. 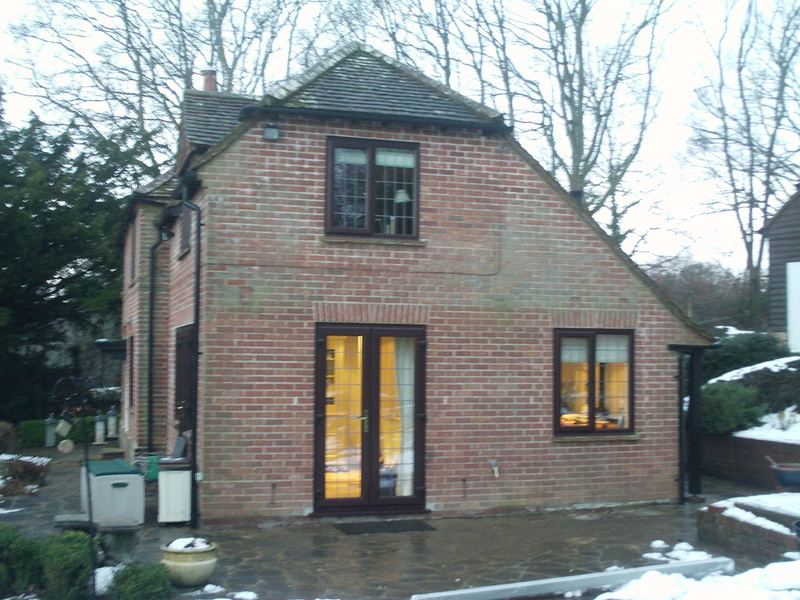 The new owners are looking forward to a spring and summer eating out looking over their new garden. The owners of this beautiful country cottage near Farnham replaced an old canvas awning which was looking very tired with a brand new glass patio awning from Just Verandas. 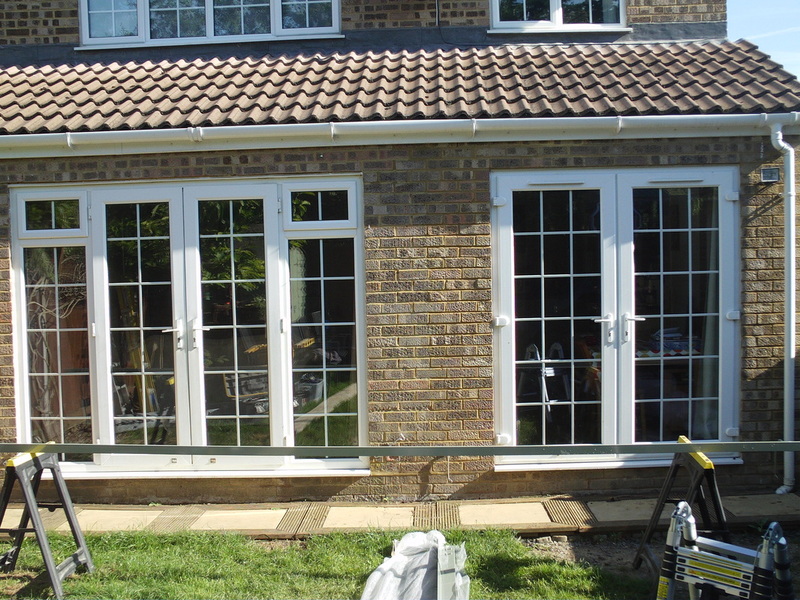 The effect is to transform the side of the house where the glass veranda is installed, making it dry and comfortable. It is the perfect smoking area, eating area and dry boot area. Well done Farnham! 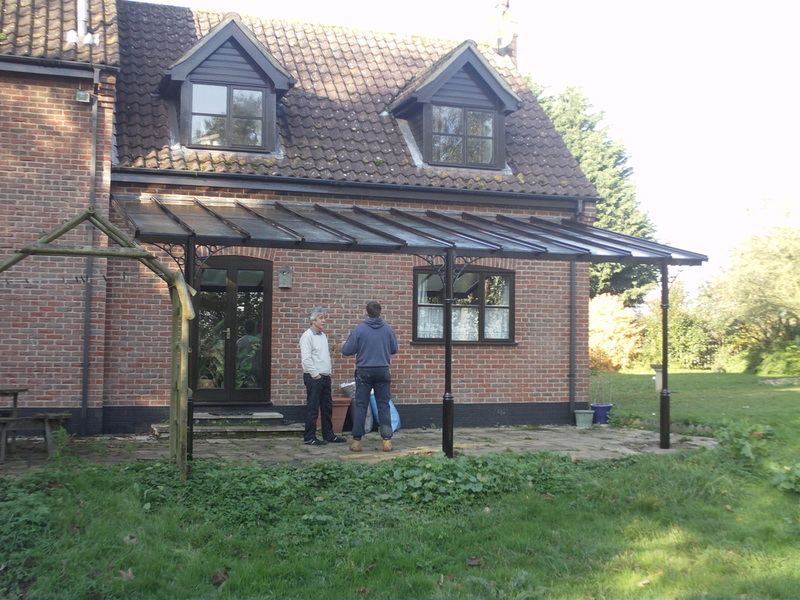 What a beautiful design was the comment of the new owner of this glass veranda installed near Halstead. We designed it to fit exactly inside a space defined by a dwarf retaining wall enclosing the patio and leading to the raised garden and lawn behind. 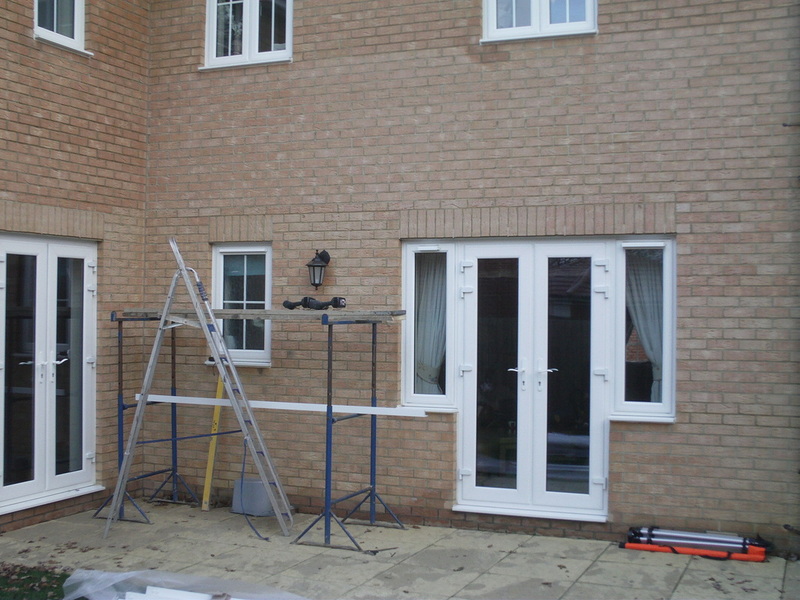 The survey was critical to the correct installation of this veranda. This lady wanted a glass veranda at the back of her house to remind her of her time living in Australia. There veranda living is a great way to enhance their enjoyment of the outdoors. 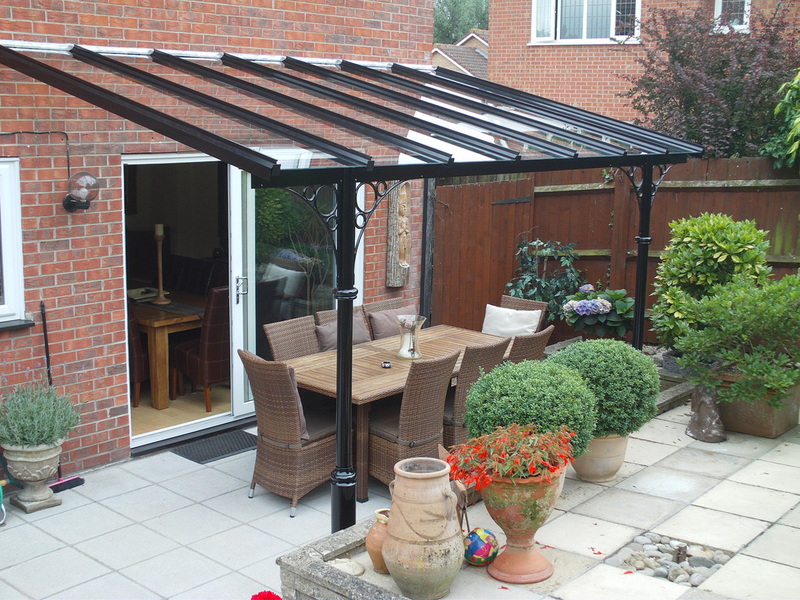 Here in the UK a glass roof really helps to keep your patio dry and makes eating and sitting outside so much easier in our variable weather. 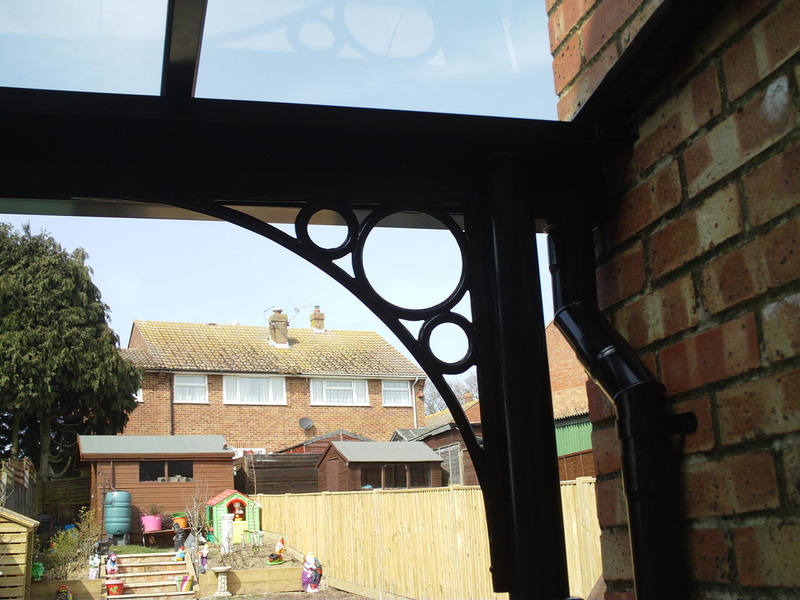 January saw the installation of a beautiful new black glass veranda at the back of a town house in Battle, East Sussex. 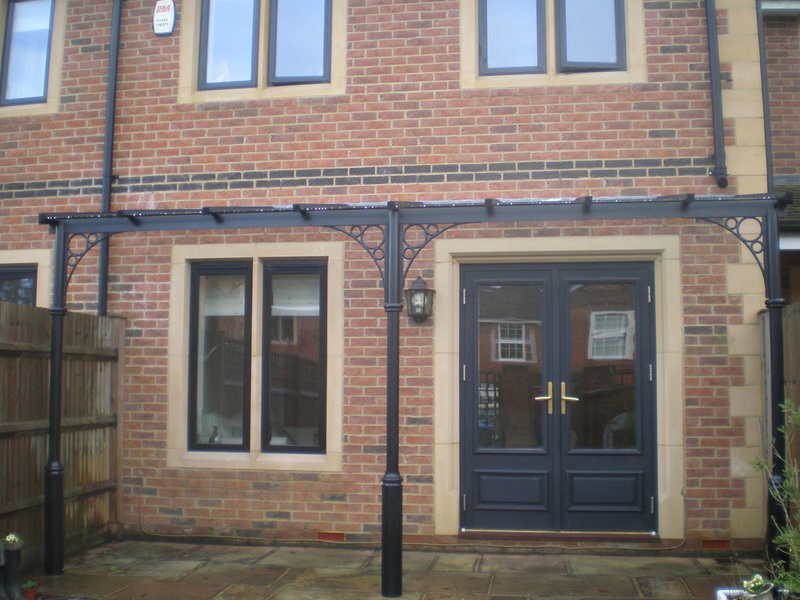 The satin black finish matched the colour of the window and door frames and provided the perfect protection for the back door and window against the elements. 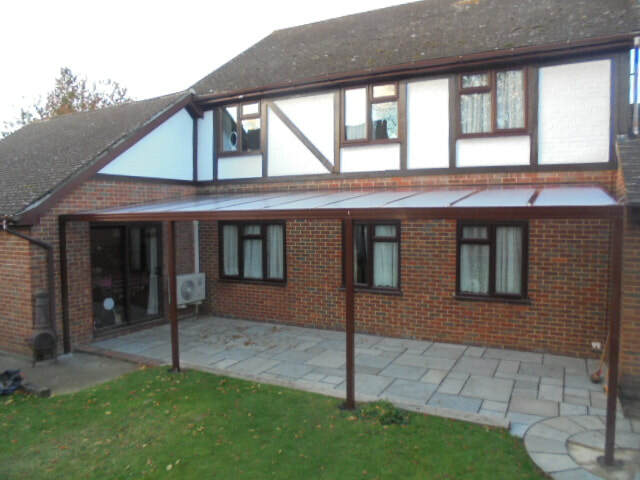 This glass veranda was installed at the rear of a 1930's house in Guildford. 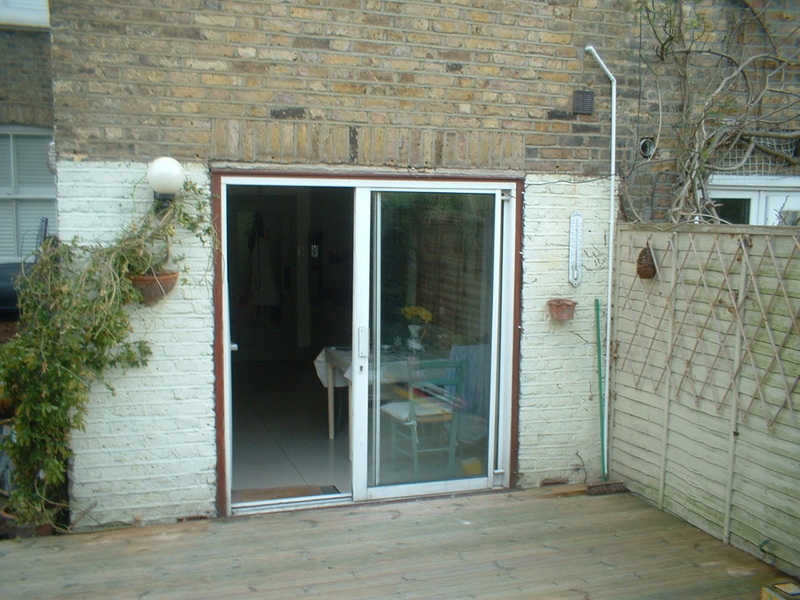 It provides the perfect frame for the french doors at the back of the property and helps to make the living area flow neatly into the back garden. 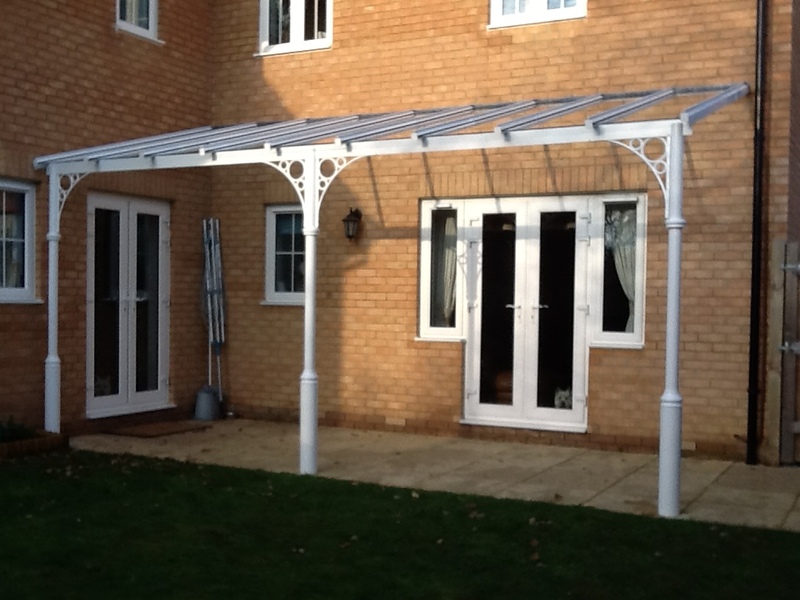 This stunning glass veranda was installed in Lawford, Manningtree to the great delight of the customer. It retains the warmth of the sun at the back of the house and means that outdoor living is much more achievable. 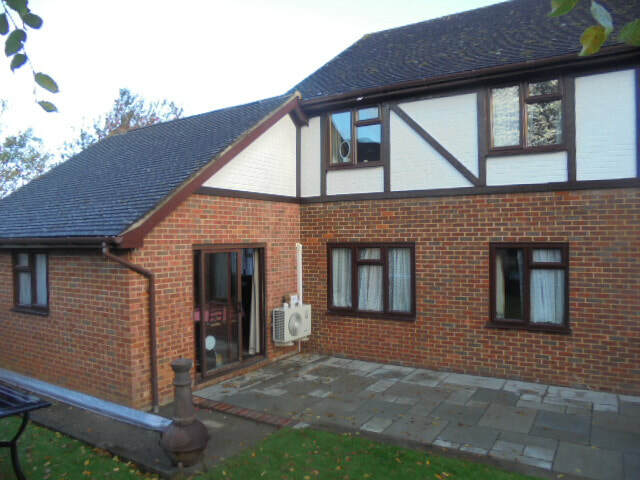 We rebuilt the soffit and fascia to give enough depth to install the wall plate and then installed the veranda as shown. 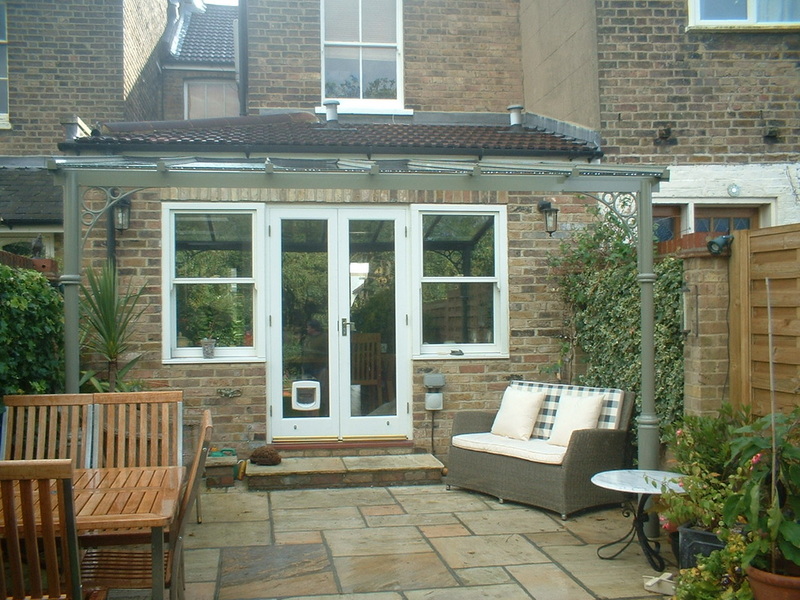 This glass veranda in Tooting was an instant success with the owner. They sent an email the day after the veranda was installed saying that it was raining but they were happy! Owning a glass veranda makes such a difference to the way you live and interact with your garden at all times of the year. The British weather we are now experiencing with the super damp atmosphere makes owing a glass veranda a necessity. 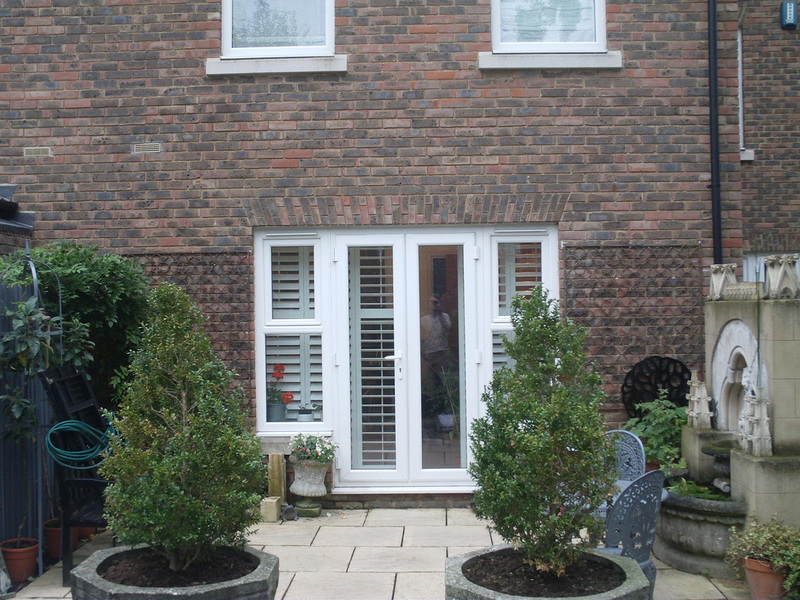 This customer has a very small garden sited between the house and a vertical drop down to the river. The view is stunning and they wanted to make the best of the space for outdoor living. The options were a consevatory or a glass veranda. 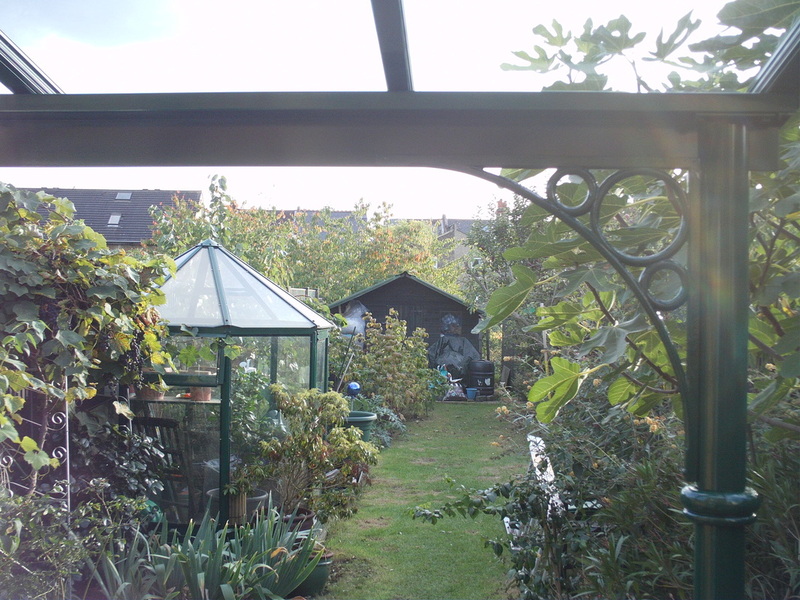 They chose the later because whilst it provides shelter in the garden it does not reduce the usable open space. 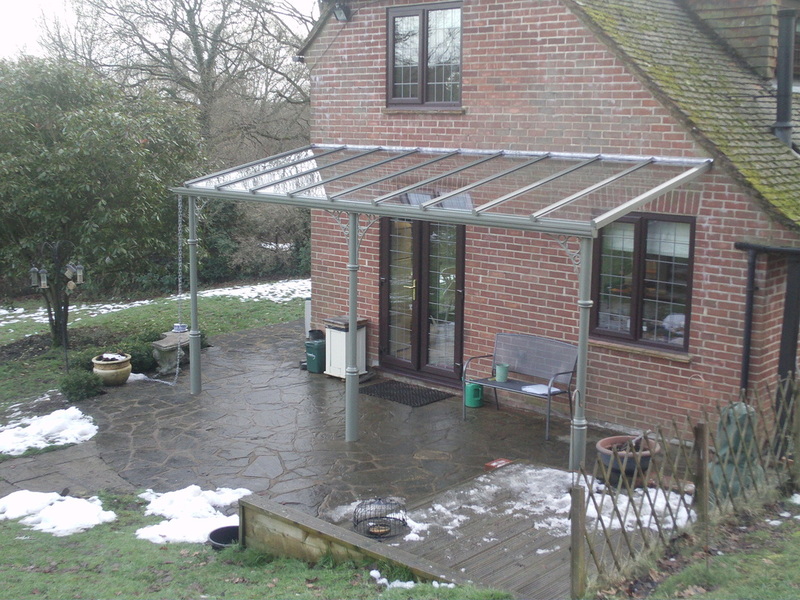 The location of the house provides quite a lot of natural shelter from the wind so a glass veranda solution is ideal. 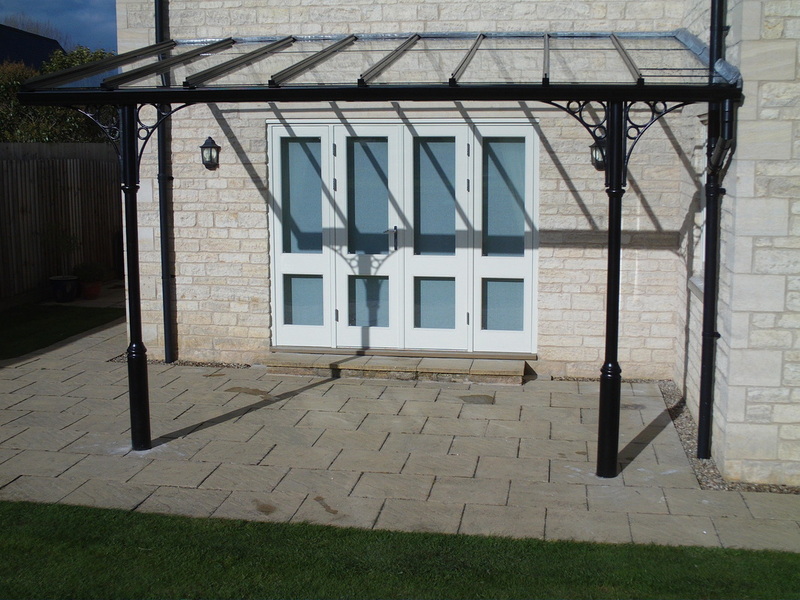 Our Victorian range complimented the new build Cotswold stone house. 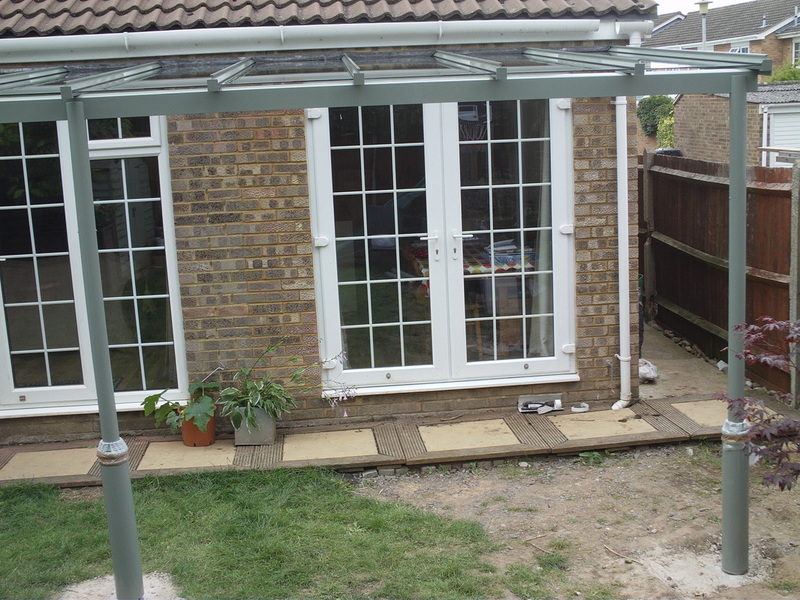 This customer wanted a small glass veranda to protect his wellington boots which he needed to leave outside the house when he returned from work. 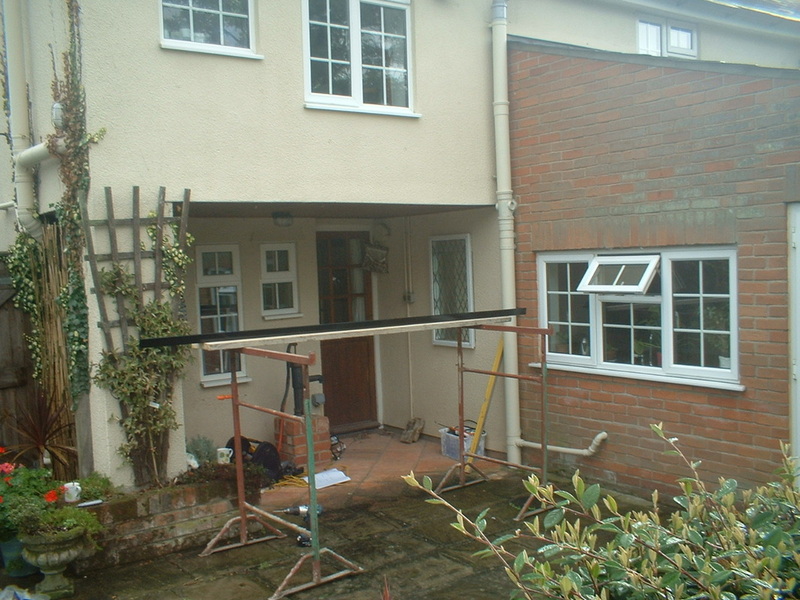 As he and the rest of his family walked from the back door down the garden on a regular basis it seemed sensible to add guttering which was linked into the existing rainwater system. The downpipe from the house roof passes neatly through a clear compact polycarbonate panel which is installed above one of the glass panels. 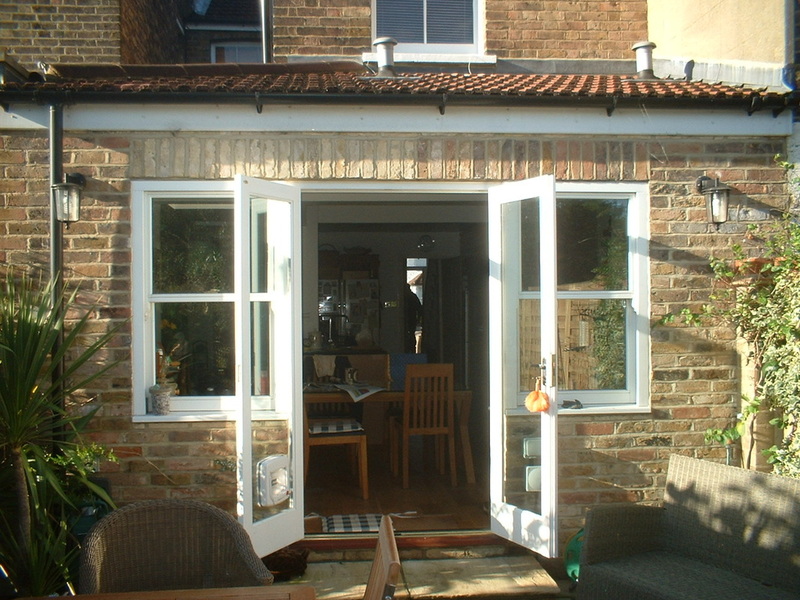 This small but perfectly formed glass veranda was delivered and installed in St Leonards-on-Sea. 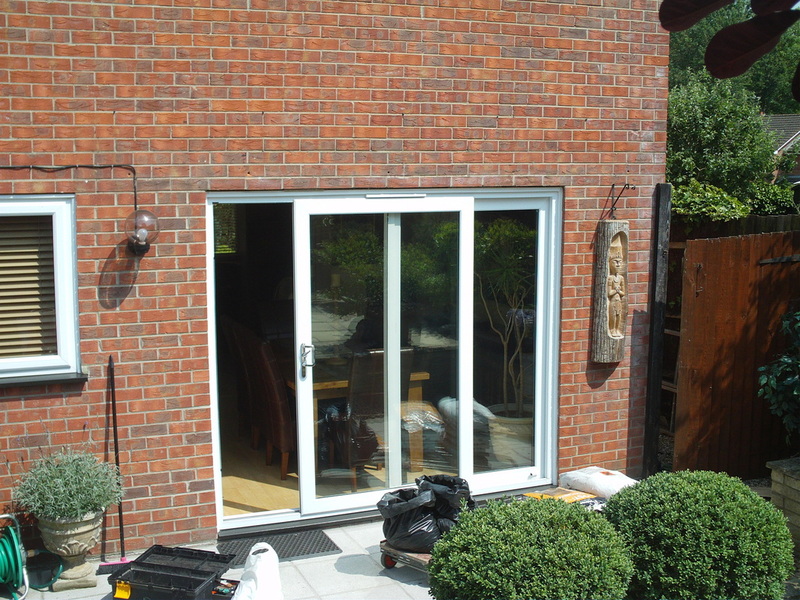 It creates a dry area behind the back door and the french doors for the newly arrived shih tzu dogs Chaz and Dave to enjoy when they are not befriending visiting veranda installers! The rainwater drains into a trench drain just in front of the veranda. 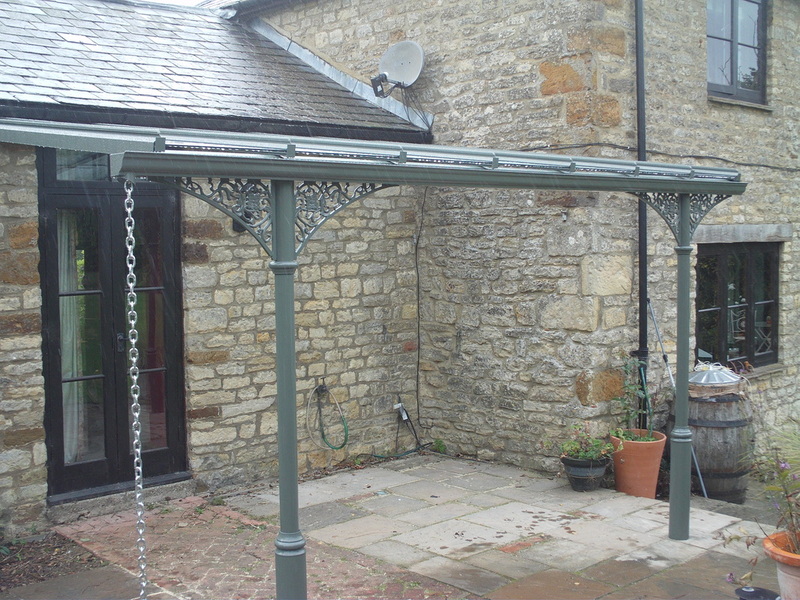 The specification for this veranda was to manufacture and install so that the rainwater on the roof of the veranda drained into a Marley Alutec downpipe. The downpipe had to run through the roof in the neatest possible way. This was achieved using a clear polycarbonate panel and sealing with high grade clear silicone. 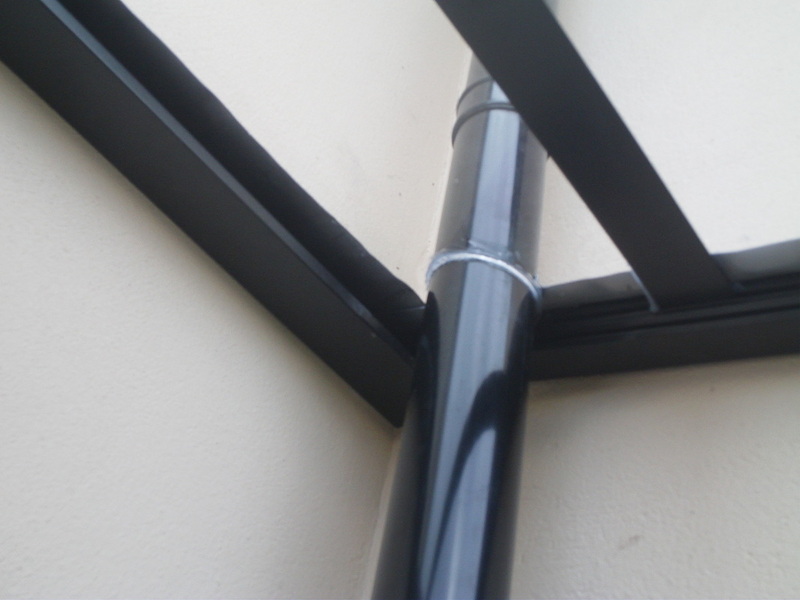 The Ogee Guttering was specially manufactured to take the larger than usual downpipe system so that an unsightly link between two different sized pipes was avoided. It looked neat and the customer was very happy with the result. When you have a modern home with windows designed to give a cottage like feel a victorian glass veranda without the ornamental cast aluminium detials might just be the answer. This home owner in Maidenhead decided that they wanted the stripped down look and went for simple post covers and the clean lines of the veranda roof structure without any ornamentation. It looks great. How do you get a glass veranda to look good with a modern house? 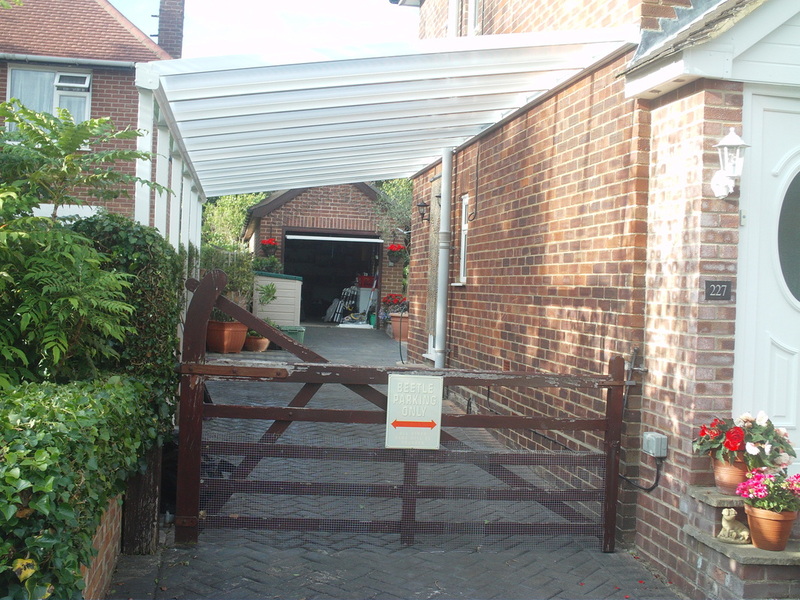 Modern Aluminium profiles with polycarbonate sheet creates this stylish contemporary look which in this case has been put to full advantage in this excellent carport installation. 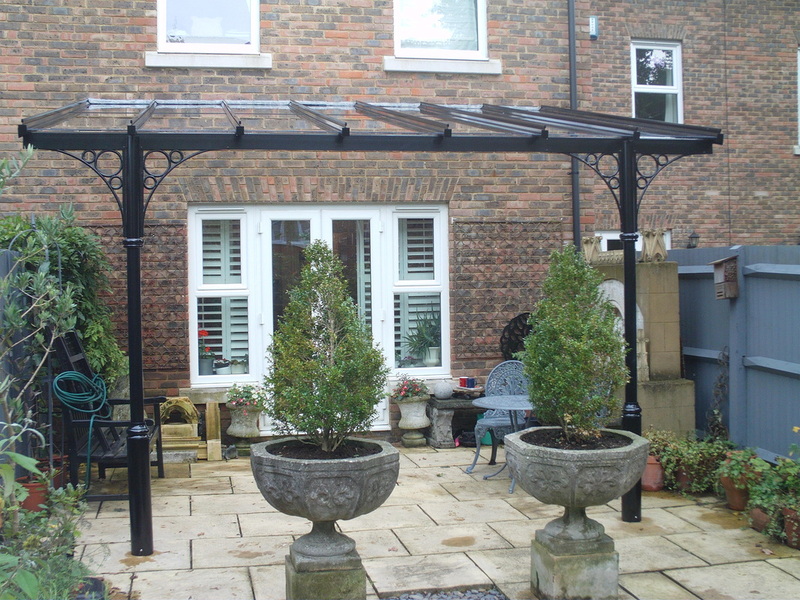 It could easily have been a patio awning to provide cover for the outside area behind a house. They all come in white so you have to be sure that is the colour you want. (We can do special colours by arrangement). When an old house needs to be helped into the 21st Century a new addition can sometimes look a bit awkward. Here the modern materials blend in with the existing weathered exterior because of the use of traditional cast aluminium spandrels to compliment the straight edges of structural aluminium. All painted in a beautiful grey green and the effect is truly seductive. This wonderful house overlooking the River Stour needed something special to enable the owners to sit outside in the mornings to enjoy their view. They managed to obtain planning permission to install a Victorian Glass Veranda on the front of their house and the results are clear to see. It has transformed the way they use their front garden. 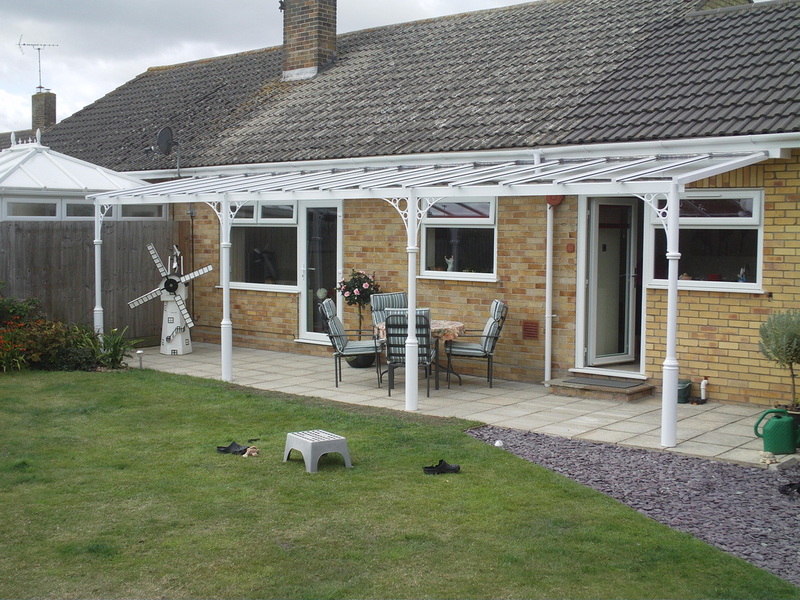 The way to make your garden weather proof is the install a new patio canopy. 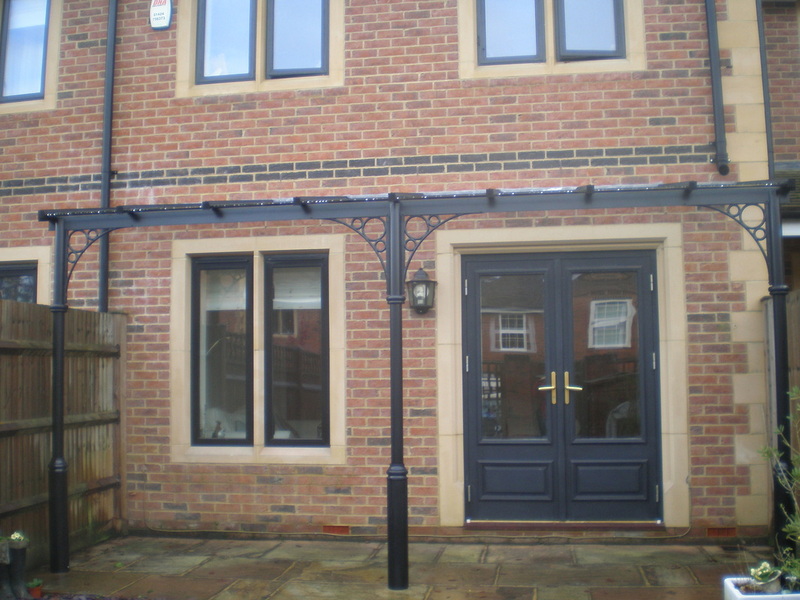 This one is powder coated in black to blend in with the paintwork on the house. The mahogany colour compliments the mahogany windows of this contemporary house. 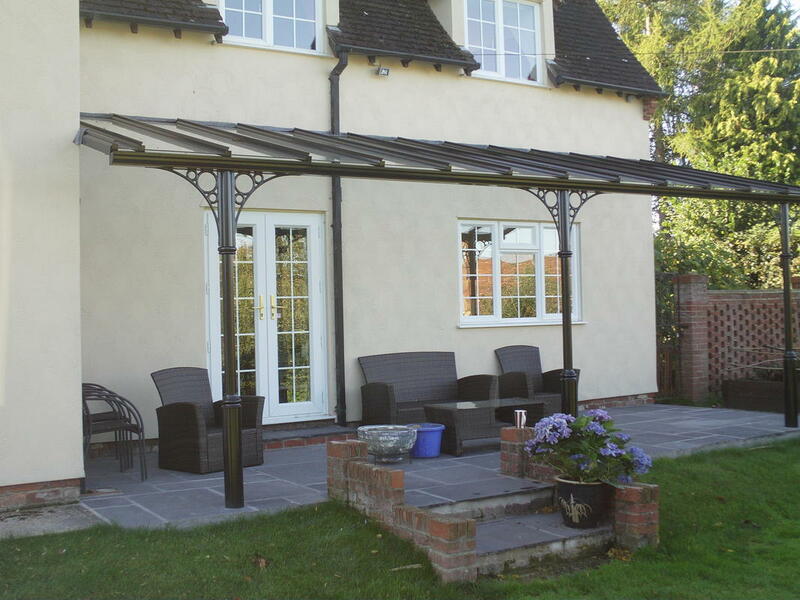 The massive 8m by 3.5m canopy provides ample dry space for all the garden furniture.